Welcome to Chicago Basin and its Fabulous Fourteeners! I’m Gerry Roach, and I’ll be your tour guide to the top of three of Colorado’s most rugged and remote fourteen-thousand-foot peaks. We’ll start in Durango, southwest Colorado’s bustling recreation hub, and board a narrow gauge train pulled by a hundred-year-old steam locomotive. The train will puff up into the Animas River Gorge, and drop us off at the edge of Colorado’s largest wilderness area – the Weminuche. From here, we’ll backpack up Needle Creek to a camp in Chicago Basin, close under the three Fourteeners, Sunlight, Windom and Eolus. We’ll spend the next two days climbing these famous peaks surrounded by waterfalls, wildlife, rocks, routes, and vaunted vistas. All aboard for adventure! – Gerry Roach - from Chicago Basin and its Fabulous Fourteeners! This DVD is clearly the best resource for climbers, hikers, and mountain lovers who want more than books can supply. The route descriptions for the Fourteeners Sunlight, Windom, and Eolus coupled with compelling video and stills give you a superior sense of what it’s like to be in the basin and on the peaks. 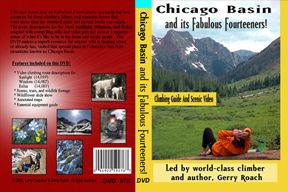 This DVD is a superb resource for anyone who is thinking about visiting the special place in Colorado’s San Juan Mountains known as Chicago Basin. The DVD also has considerable footage of the Durango and Silverton narrow gauge railway as well as scenic slideshows of wildlife and wildflowers. This comprehensive product also includes annotated maps and an essential equipment guide. Photographed by Larry Chapman and narrated by Gerry Roach, this visual and audio feast makes a perfect home companion to Gerry’s Fourteeners guide, or you can buy the DVD by itself. Click to view a video sample with Windows Media Player. Click to view a video sample with Quicktime.